A return to Chile, and maybe I’ll just begin to write about by returns, which happened a few weeks ago. I’ve now surpassed my goals for last year: sailing, hiking, Parque Andino Juncal, emotional and physical improvement. And here I am in Chile for a reporting trip for the month of July. Among the pending items are the spring at Parque Andino Juncal. I met with a friend at his home in Pirque. Along with his wife we discussed ambitious ideas, talking late into the night about plans and dreams for the Aconcagua River headwaters. 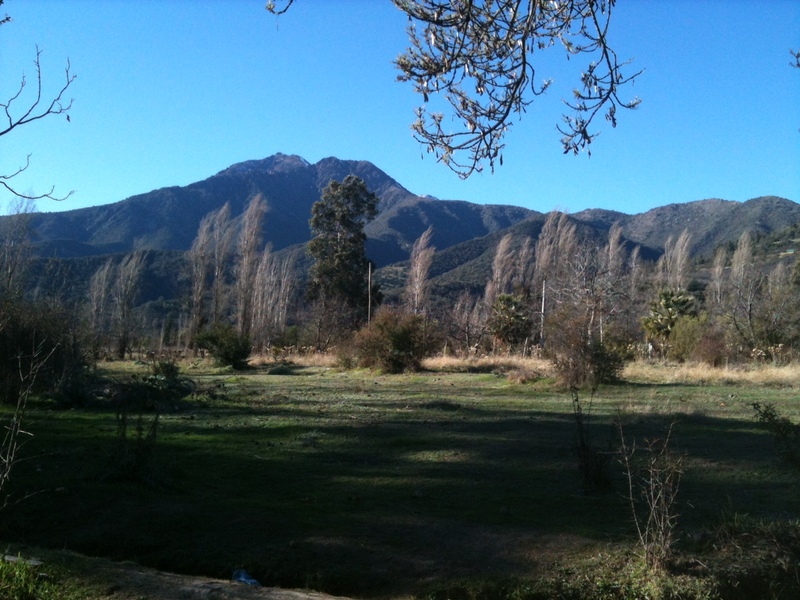 I awoke to clear skies, and Cerro Purgatorio in the distance, where my friend and his wife climbed for the winter solstice, as they do every year. I’m thinking of Roberto Bolaño’s 2666, published in 2004. A book about one writer and four academics and lauded by critics worldwide, I am more astounded by the 20-line sentences that feel long only as one approaches the last few words, which wrap up those last 30-seconds of your life with swift, assured, surprising prose. It is nothing like Martin Eden, written in 1909 by Jack London, which is a story about just one writer. The writer and intellectual works his way up from ignorance and lack of formal education to surpass all those around him. He leaves work as a sailor before the mast to toil with single-minded focus as a writer, a writer whose work transcends all else, whose work is an expression of beauty and has transformative effects upon the culture in which he lives. Of course no one cares about what he has written, until they do, and he becomes rich and famous. At that point the opinions of the fawning, herd-like mass is nothing but disillusionment to Eden and he sets off in a new direction. I’m only 75 pages into Bolaño’s’ 1100-page final work, finished just before his death, “that explores 20th-century degeneration through a wide array of characters, locations, time periods and stories within stories,” according to Wikipedia writers. Whatever I will write or live on this page, of course, will never reach these heights. I can only describe what I see, feel, or hear. This will be focused on my exploration of the Chilean craft beer industry, and, beginning on Thursday the trails of Parque Patagonia, a 200,000-acre conservation initiative 1,200 miles south of where I am now.